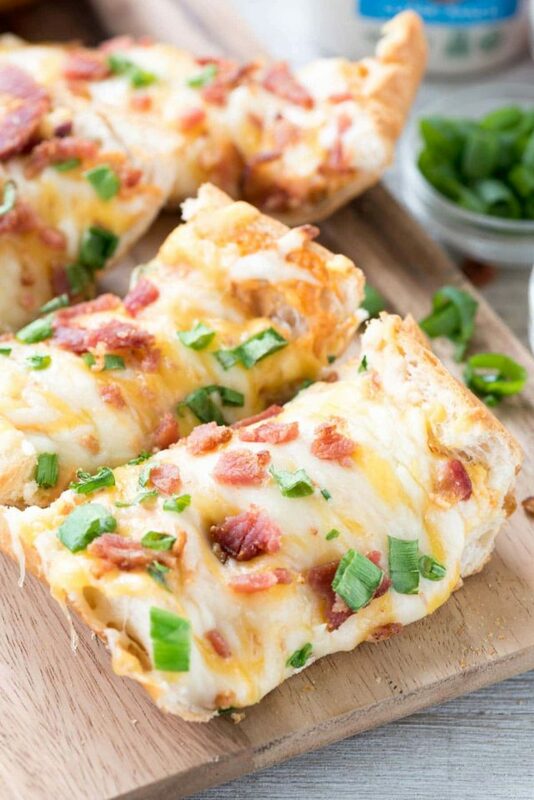 Weight Watchers Pizza Dough Recipe – just 2 ingredients in this pizza crust – no rising time! Plus, there’s only 12 WW SP for the entire crust recipe, so if you want to eat the entire thing, you just need to save your weekly points. Even if you’re NOT on Weight Watchers, this crust is delicious. It tastes JUST like a regular pizza crust without any of the wait time for rising! I looooooooove pizza. Like, soooooo much. It ranks up there with my top foods: brownies, pie, Taco Bell, sourdough bread, wine, and pizza. If I never had to worry about calories or cholesterol or diabetes, I’d only eat those things, for real. I’d toast up bread for breakfast, hit Taco Bell for lunch, and make homemade pizza every night for dinner. When I decided that this year was the year of ME (and, BTW, I’m still struggling to get on the train) I was immediately sad because I figured I couldn’t ever have pizza again. That thought was immediately pushed out of my head because the second you say “never” is the second I eat an entire large on the way home from the pizza parlor. I can have pizza, in moderation. Can I have pizza every day? No. Every week? Probably not, unless it’s only 1 slice and I save up my calories for it. Now, if I can have my pizza every week, save up the calories, but still eat something healthier? THAT is a total win, and that is this pizza crust recipe. I’m calling this Weight Watchers Pizza Dough, but it’s also called 2-ingredient pizza dough or skinny pizza crust or so many other things. I didn’t invent this recipe (I have no idea who did) but I’m sharing it because it’s absolutely genius. If I’m going to eat a cheesy pizza for dinner I want the calories to count; that is, why eat something mediocre that’s going to leave you wanting MORE because the craving you had wasn’t satisfied? It’s like eating ice milk because you’re craving ice cream. Chances are, you’re still craving it when you’re done. Just eat a smaller portion of the ice cream and move on from the craving! I feel the same way about Friday Night Pizza Night. Friday isn’t the same if I make instant pot chicken. No, Fridays are for takeout (or copycat takeout, that is). 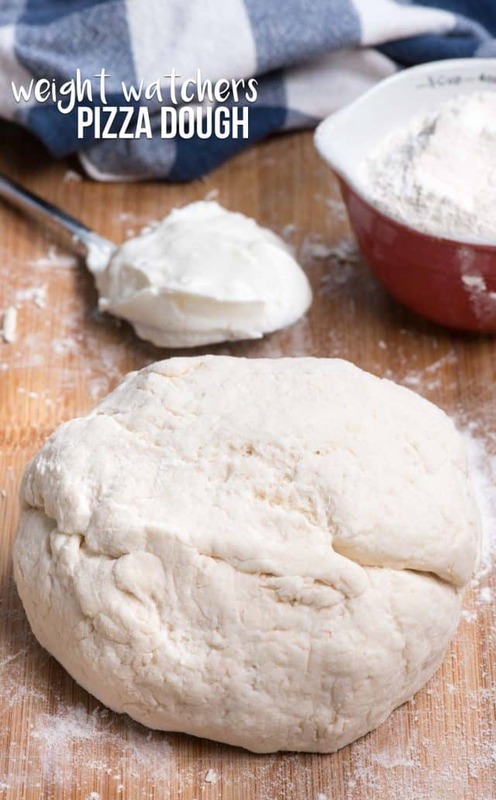 When you make Weight Watchers Pizza Dough, you can eat the whole dough recipe for only 12 points. 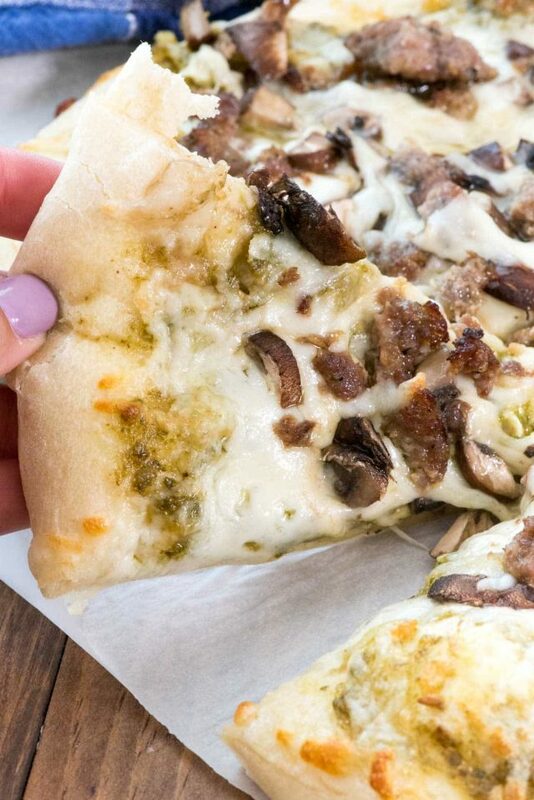 For you calorie counters, that’s only 520 calories for the entire crust (sans toppings). 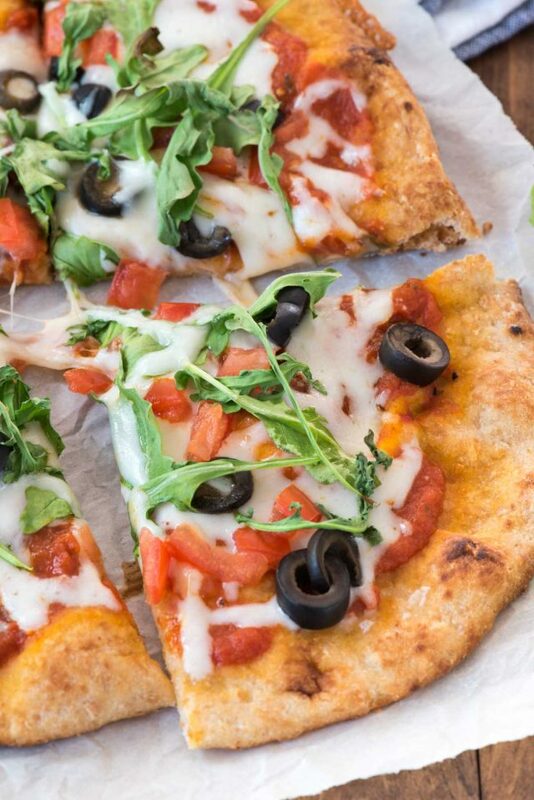 But because this 2-ingredient pizza dough recipe is made with a secret ingredient, the protein is amped WAY up: there’s a whopping 17g of protein in this crust recipe. I’m sure you’ve seen this before so you already know what secret ingredient I’m talking about. Do you know? Nonfat Plain Greek Yogurt. Yep, that’s right. This recipe has only TWO ingredients and one of them is a protein powerhouse. 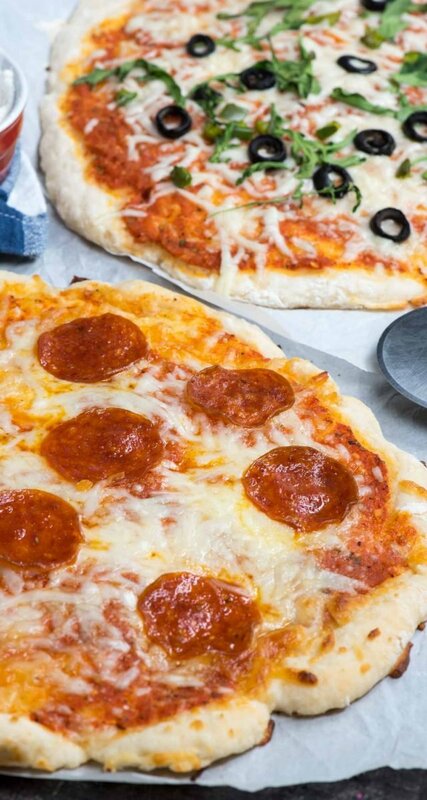 Weight Watcher Pizza Dough has only two ingredients and is only 12 points (or 520 calories) for the entire recipe. So what is the other magical ingredient? Self-Rising Flour. Even better: it tastes like a regular pizza crust. I promise. It really does! I was nervous it would taste funny or be soggy or weird and it’s not. It just tastes like regular pizza crust. Of course, toppings are extra calories, but if you’re dieting, my homemade pizza sauce is healthier than a lot of the ones out there. Use low-fat cheese if you want or make it a vegetarian pizza. Split it with your husband or wife or kid and you have the perfect portion controlled Friday Night Dinner. Welcome back, pizza night. We missed you so. Nonfat Plain Greek Yogurt: use your favorite brand. Just make sure it’s nonfat and plain. Self-rising flour. Don’t have it? Check out my post on how to make self-rising flour. Simply stir the ingredients together and then knead on a lightly floured surface until the dough comes together. Roll it out, top it, and bake it. Want a flavorful dough? Add some granulated garlic or spices to the dough. Just make sure the pizza is cooked all the way through before baking. If you want a crunchier crust, pre-bake it for a few minutes before topping it. I cannot wait to try this recipe to make bread and other bread recipes! 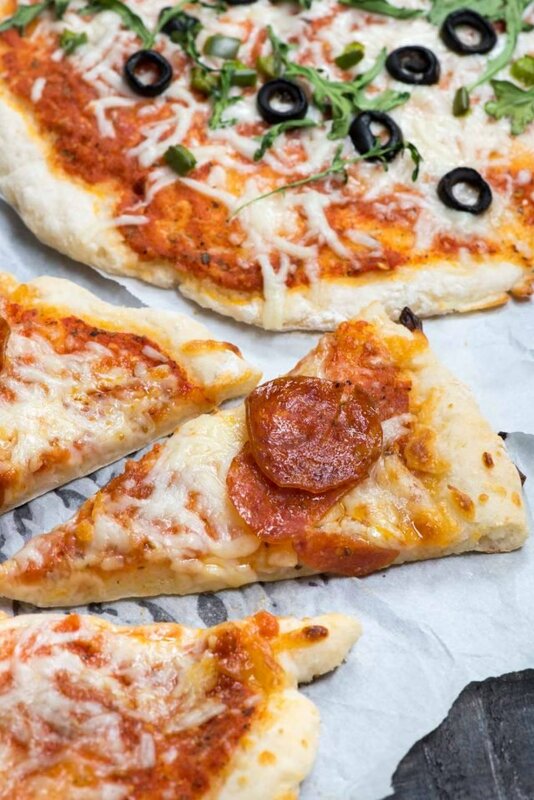 Weight Watchers Pizza Dough Recipe - just 2 ingredients in this pizza crust - no rising time! Plus, there's only 12 WW SP for the entire crust recipe, so if you want to eat the entire thing, you just need to save your weekly points. Even if you're NOT on Weight Watchers, this crust is delicious. It tastes JUST like a regular pizza crust without any of the wait time for rising! Stir together yogurt and flour until a thick dough forms. 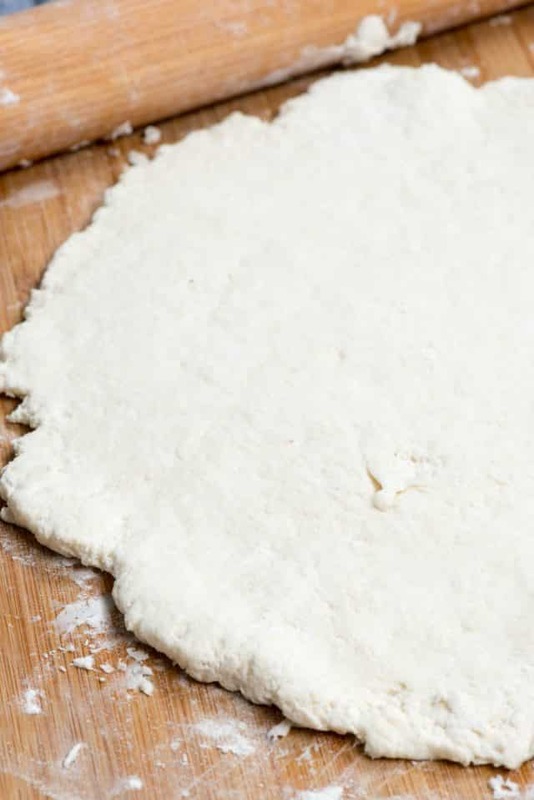 Turn out dough onto a lightly floured surface and knead until it forms a dough ball. Place ball on a sheet of parchment paper. Roll out to desired size (approximately 10-inches diameter). Place on a baking sheet or pizza pan/stone. Top with desired toppings. Bake for 20-30 minutes, or until crust is browned and cooked through. How is this so low in calories? 1 cup self raising flour = 340g = 1,139 calories. Is there a specific self raising flour I should be getting to bring the calories down? Divide the dough ball in four knots and the total WW points for each knot is 4. I rolled the knot into a rope, cut it into inch size pieces and then rolled each in a mixture of 1 T nutritional yeast and a bit of garlic salt. They were delicious and gave me the bread fix I’d been looking for since starting WW. A little goes a long way! Hello Dorothy, great idea I am gonna make and taste it soon! Thanks a lot! This was so good! I’m really impressed and will definitely be using this again. Makes me not feel so bad for eating the whole thing! Do you think this could be made with whole wheat flour instead of white flour?